New research shows that smartphone dependence has Canadian banking consumers craving independence in their financial decision making. Innovative strategies and seamless experiences will win over mobile-first, forward-thinking consumers. Rushing to the bank before it closes is becoming a problem of the past in Canada. Today, nearly half of all Canadians use their smartphones for finance-related activities at least once a week.1 While the most common activities right now—checking account status/purchase history and making payments to a business1—are fairly straightforward tasks, Canadians are looking for their banks to provide more services and better experiences on mobile. Canadians expect a lot from their mobile experiences. And that extends to what used to be more involved in-person banking activities like researching mortgage options and choosing a checking account. Instead of heading to the bank, people want to be able to do more on their own time and at their own speed. Part of this newfound independence comes from Canadians' increased comfort in completing financial tasks on their smartphones. As banks build better and more secure mobile tools, people are quickly becoming more confident in the safety of online transactions, and their expectations will continue to grow. Winning over consumers will come down to which brands can create (or refine) robust online presences that translate seamlessly to mobile. Canadian banks, marketers, and agencies need to partner to meet the needs of Canadians in their discovery, research, and decision-making mobile moments. 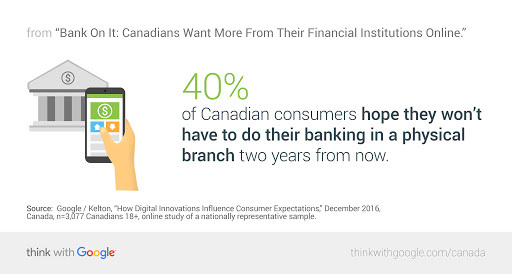 Contrast that with the fact that 40% of consumers hope they won't have to do their banking in a physical branch two years from now (due to technology),3 and it's clear that it's time for Canadian banks to re-think customer experiences on mobile from top to bottom. Instead of simply looking for new technologies you can incorporate, think about what your customers expect (and what they will come to expect in the future) in every scenario and build your mobile experiences around that. 1. Help mobile consumers confidently choose you by adding customer ratings and reviews for your products. 3. Build seamless mobile experiences that respond to consumers’ needs in their micro-moments all along the way. Forward-thinking customers are looking for forward-thinking experiences and tools from their favourite banks. Mobile innovation starts by thinking beyond simply having a mobile presence and instead putting the customer at the centre of everything you do. 1 Google/Kelton, “How Digital Innovations Influence Consumer Expectations,” December 2016, Canada, n=2,225 Canadian smartphone users 18+, online study of a nationally representative sample. 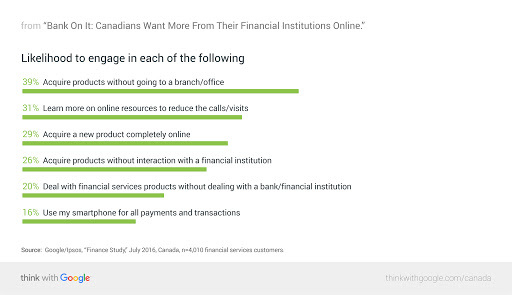 2 Google/Ipsos, “Finance Study,” July 2016, Canada, n=4,010 financial services customers. 3 Google/Kelton, “How Digital Innovations Influence Consumer Expectations,” December 2016, Canada, n=3,077 Canadians 18+, online study of a nationally representative sample.